We were so excited to unveil our impressive new show-stopper of a stand, and are thrilled to hear it made such a positive impression. In addition, we were delighted to scoop two awards whilst at the show. 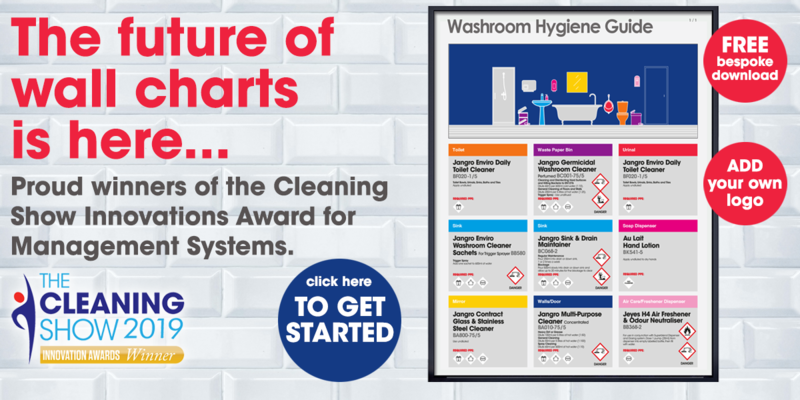 We were placed first in the Tomorrow’s Cleaning Awards for our versatile e-training platform, Jangro’s Learning Management Solution (Jangro LMS), and also won The Cleaning Show’s Management Systems Innovation Award, for the launch of our Digital Bespoke Wall Charts. We’d like to say a big thank you to everybody involved! After retiring the Jangro Bus last year, we knew that our new stand had to make a big impression to live up to its predecessor. The Jangro Garden certainly did that – not only did it emphasise our commitment to the environment and making sustainable choices, but it also proved to be a great place to relax with a refreshing mocktail or a coffee and talk all things Jangro. And boy, did we have a lot to talk about! We launched our hot-off-the-press sustainable cleaning catalogue, ‘Think Sustainable. For a better future’, introduced our new, award-winning, Digital Wall Chart Creator, and showcased our first-ever Virtual Reality platform. Visitors were able to have a go using this cutting edge technology, and certainly enjoyed their demonstrations. Our friendly national accounts team was also on hand, offering help and advice, and chatting to visitors in the cosy ‘snug’ area of the garden. This was a popular destination to relax and enjoy a refreshment. Thank you to everybody that left a donation for their teas, coffees and mocktails – thanks to your generosity, we raised £192.00, which will be donated to Afasic (Association for All Speech Impaired Children), a parent-led organisation set up to help children and young people with speech and language impairments, and their families. Finally, a big thank you once again to everyone who came and talked to us, did business with us, and made our time at The Cleaning Show such a success. We had a fantastic time networking, sharing ideas on innovation and best practice, and unveiling our exciting new launches. As for winning two awards, that was the icing on the cake.